UK Astronomy Technology Centre (UK ATC) (at the Royal Observatory, Edinburgh). 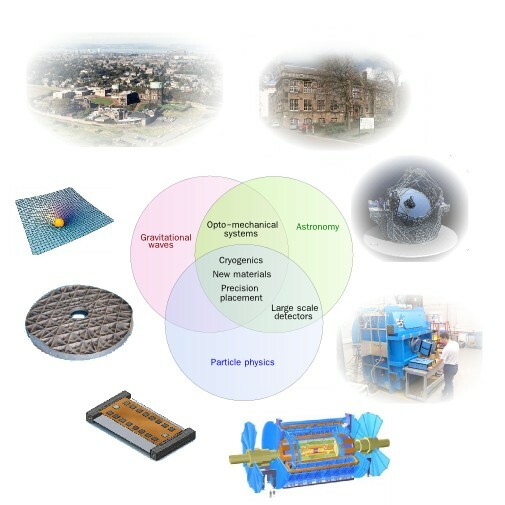 TEOPS combines the efforts of groups developing leading edge technology in the fields of gravitational wave detection, astronomy and particle physics, by the sharing of equipment, facilities and expertise. Together, we have opened up new opportunities to carry out research and to develop links with industry. TEOPS is supported by SUPA, The University of Glasgow, Edinburgh University and the UK ATC. With its unique combination of technical expertise, scientific knowledge and access to exceptional facilities, TEOPS represents a "one-stop-shop" for industry in the fields of cryogenics, advanced materials, large scale detectors, optomechnical systems and precision placement. Commonality: Information on the areas that link the TEOPS groups. Activities: Current TEOPS activities and programmes. Facilities: Facilities and services available within TEOPS. Groups: More information on the groups making up TEOPS. External links: Links with external organisations.